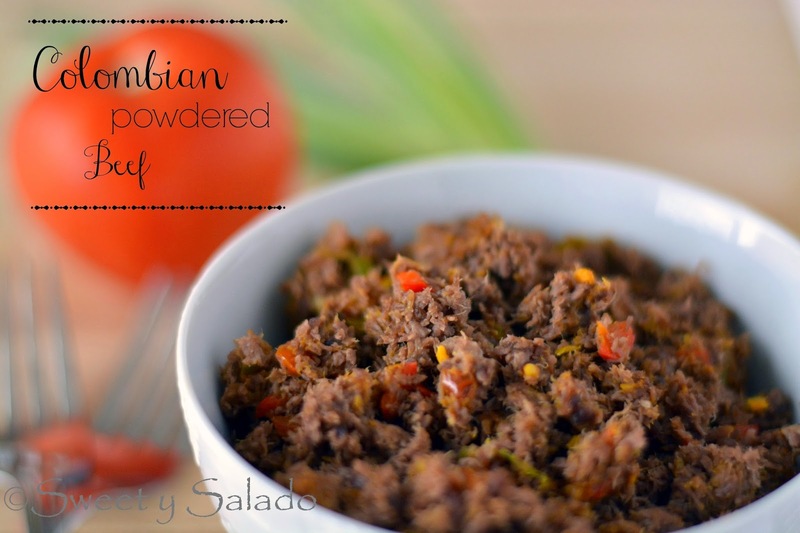 Colombian powdered beef, or ground beef, is another side dish that is frequently served in most Colombian homes. The most famous dish that is served with this beef is the “bandeja paisa” or “paisa platter”, but you can serve it whichever way you want, and it works perfectly for making Colombian empanadas. This recipe is usually made with “skirt” or “flank” steak but for years I have been making it with chuck roast because it’s less expensive, has a lot of flavor and the end result is practically the same. However, feel free to make it with whaever cut of beef you prefer. In the past, people used to grind the beef with a meat grinder, the same grinder that was used for grinding hominy to make Colombian arepas. Nowadays, you can easily grind it with a food processor, even though I’m sure many people in Colombia still use their grinder for making this famous recipe. The important thing is to end up with a pulverized texture with no lumps whatsoever. As I said earlier, this powdered beef can be served with any other side dish, I even serve it for breakfast with arepas if I have a lot leftover. You can also make it two different ways, you can make it with the sofrito as I show in this recipe, or you can make it without any other sauce, the same way my mom used to serve it. 1. Add the water, white onion, green onion, garlic and beef in a pressure cooker. Season with salt to taste. Cover and bring to pressure over high heat. Then, lower heat to medium low and cook for 30 minutes. ** If using a regular pot, bring to boil over high heat, then, reduce heat to medium low and cook for 1 hour. 2. Remove the pot from the stove and release the pressure according to the manufacturer’s instructions. Then, remove the meat and let it cool completely. You can use the beef stock to make soups or sancochos. 3. 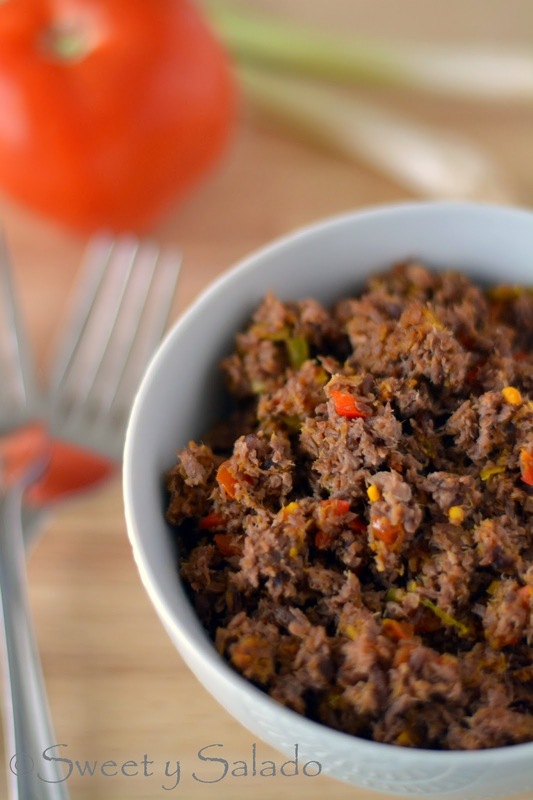 Once the meat has cooled, grind it with a meat grinder or food processor until it is pulverized. Make sure there are no chunks of meat. 4. Heat the olive oil in a large pan over medium heat. Add the green onion and the garlic and cook for 2-3 minutes. Then, add the red pepper, green pepper, tomato, and season with the cumin, color and salt and pepper. Cook for 5 minutes or until the vegetables have softened. Now, add the powdered beef and stir to cover completely with the sofrito. Serve immediately. The oil gives the vegetables flavor and it prevents them from sticking to the pan. You can use as little or as much oil as you want, so you can start with 1 tablespoon and take it from there. Awesome, this is exactly what I am finding. Love the final result. Thanks for sharing!